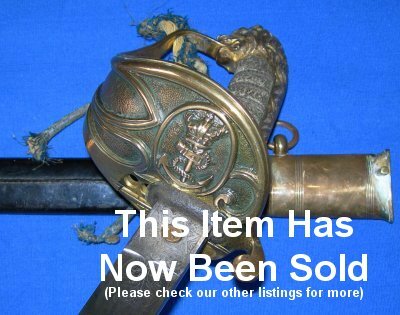 It is rare to find a Victorian naval sword in such good condition, the etching still very clear (although the maker's name to the ricasso has been rubbed down to be very feint from the sword sheathing and drawing. 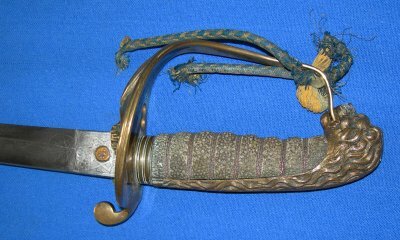 The 29 3/4 inch blade is in good condition, the etching including fouled anchor and British Royal Coat of Arms still good. The blade is firm in the hilt. The hilt with some tarnishing (will remove) but still good. The fishskin grip grubby but will clean and the all important twisted grip wire bindings are good. The scabbard has shrunk a little (hence the white band at the base of the middle locket) but should clean up well. 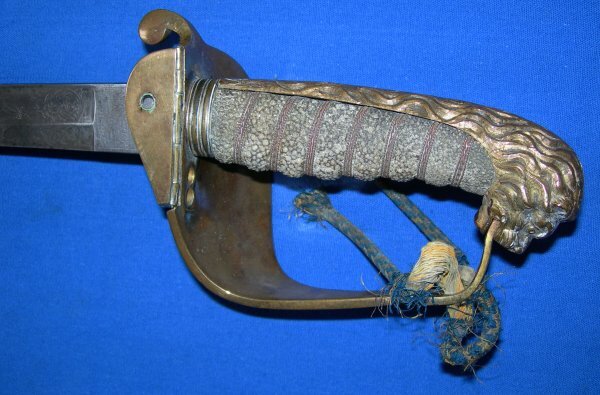 The sword sheathes and draws well, and the locking pin on the top scabbard fitting locates properly into the folding guard hole, the folding guard working well. The remains of the original sword knot are still attached. Easily an above average sword. A solid investment. Please quote item reference number I44 (1044). Further / full sized pictures available upon request.